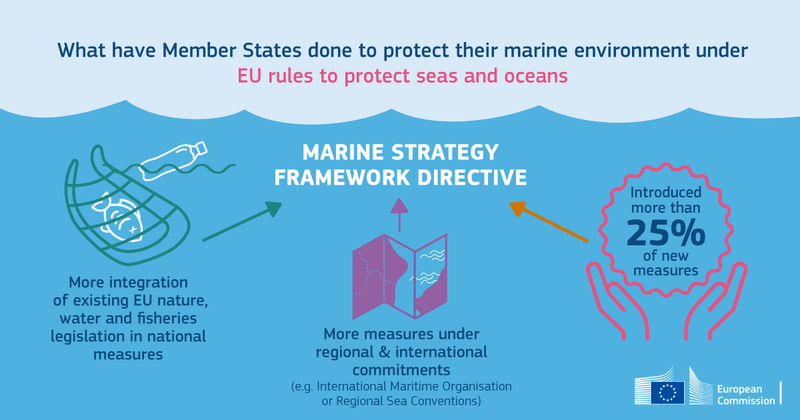 Today the European Commission published a report on the implementation of the EU Marine Strategy Framework Directive assessing the measures put in place by EU Member States to achieve 'good environmental status' by 2020. This concept is defined by measures conserving biodiversity and tackling pressures like overfishing, seabed damage, marine litter and contaminants. One in four measures announced by Member States has been developed specifically for the purposes of this Directive to target pressures on the marine environment that would otherwise not be covered. Nevertheless, the assessment shows that the goal of ‘good environmental status’ of European marine waters by 2020 will not be achieved without further improvements. In some cases, such as marine litter, where Member States lacked coordinated measures, this shortcoming is partly addressed at EU level, through the EU’s Strategy on plastics and its subsequent actions. This report does not cover all EU Member States due to late reporting. EU Member States are required to set up six-year strategies through which they assess the status of their marine waters; determine 'good environmental status' on the basis of 11 descriptors (such as biodiversity, commercial fish stocks, marine litter and sea-floor integrity); set environmental targets, develop and implement monitoring programmes; and finally develop and implement measures to achieve this good environmental status objective.